There is one food that is not “foreign” to the tongues of people of Indonesia, it is a “friend” of daily meals: “TOFU”.But make no mistake! 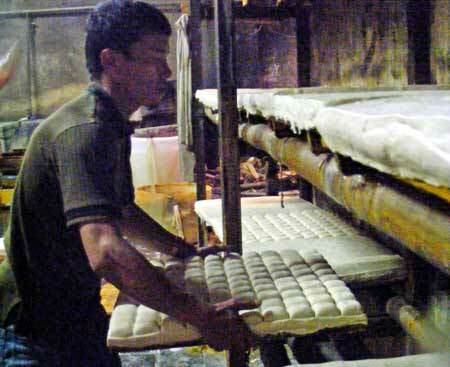 There is a delicious tofu, soft and unique, which is the mainstay and the pride of citizens of Bandung: CIBUNTU TOFU! Why is that? Cibuntu tofu derived from the work of citizens Cibuntu, Babakan Ciparay Village, District of Bandung Kulon. In this area the majority of its population living as artisans or producers know. Including existing residents in the Village of Warung Muncang. So often this area gets the nickname “tofu blocks”. This is because this business is a hereditary business. Where is the blend of soy bean special election, by making the typical (according to tradition), making tofu Cibuntu has “class” of its own. Every day, people who want to see any process of knowing can freely come to visit. Indirectly, the region Cibuntu become tourist area for people who want to see how making of the famous Cibuntu tofu. This entry was posted on Tuesday, September 14th, 2010 at 9:32 pm	and tagged with Bandung, Cibuntu, destination, foods, soybean, tofu and posted in Foods & Beverages, Souvenirs. You can follow any responses to this entry through the RSS 2.0 feed. ITB’s Art Market 2010 : THE DAY ! Hotel Sabang …. (still) Not in Sumatera! Good Snack, Low Price … Go To Pasar Baru! Steamed Brownies, Don’t Live Bandung Without It ! CILOK … Simple Yet Delicious! TripAdvisor™ TripWow ★ My Bandung Slideshow Slideshow ★ to Bandung. Stunning free travel slideshows on TripAdvisor via My Bandung Slideshow Slideshow.